Send us your photos! Vote for your faves! Show us how you do summer in Sonoma County! 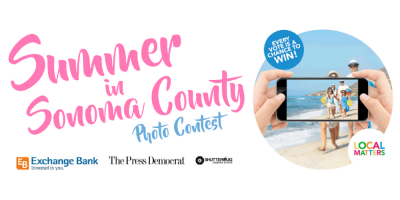 Submit your favorite photos of you, your friends and family having summer fun in Sonoma County and vote for your favorites. Everyone has a chance to win. Win one of three fabulous adventures from Safari West, Fairmont Sonoma Mission Inn and Sonoma-Cutrer Vineyards. Submit a new photo each week. Vote every day. Every submission and every vote is another chance for you to win! Winners will be announced Labor Day weekend. Between June 10 and August 23, submit your favorite photos of you, your friends and family enjoying summer right here in Sonoma County. You can submit up to one photo each week. Each submission is your chance to win one of the three grand prizes.